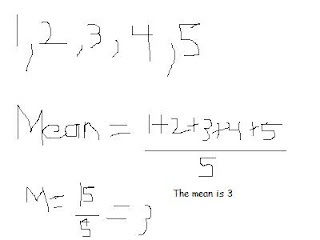 Here is a video i found on mean, median, and mode ! Arrange data in ascendeing numerical order. Divide the sum of all of the numbers in that set of data by how many numbers there are. With an outlier less accurate.. Arrange data in ascending numerical order. 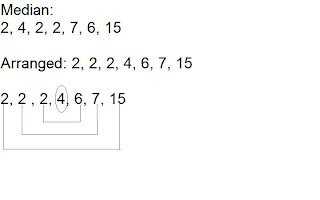 Find the middle number by crossing of the end numbers until you have one or two numbers left. 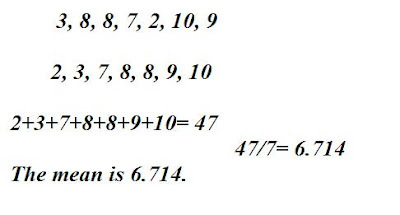 If you have two numbers left, add both of those numbers together and then divide that number by two. 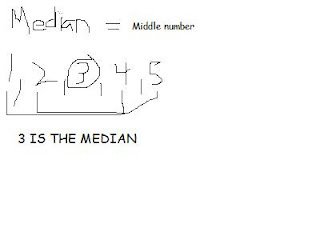 If you have one more number left, you have got your median. Great to use if there is an outlier. You can have more than one mode or no mode at all. 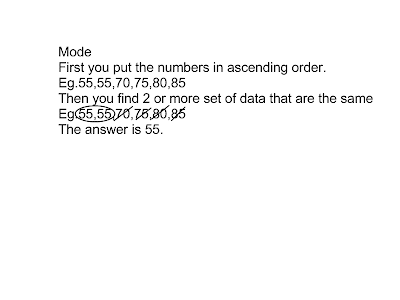 Arrange data in ascending numerical number. Subtract the largest piece of dat from the smallest. 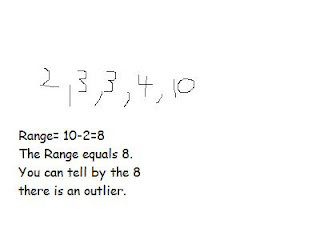 If you have a l arge range there is a posibility that you have an outlier. This is a video that I found about mean, medain, mode, and range. The sum of a set of values divided by the number of values in the set. 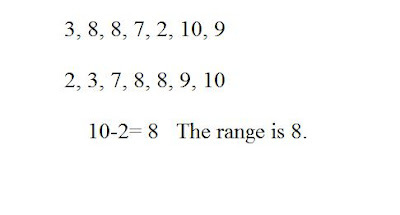 The middle number in a set of data after have been arranged in order. 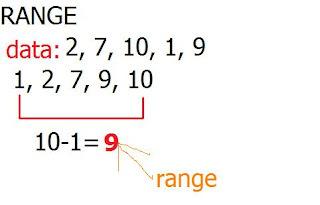 Range is obtained by taking the difference of the maximum and minimum values of a given data set. with an outlier the mean is less accurate " average"
Here is a video i found on mean, median, and mode. 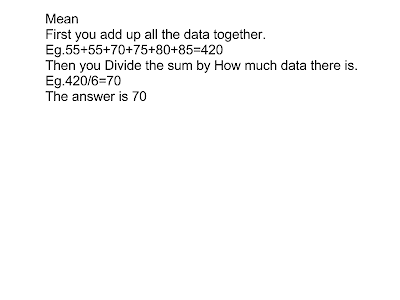 Add up all of the data, and divide the sum by how many set of data there are. 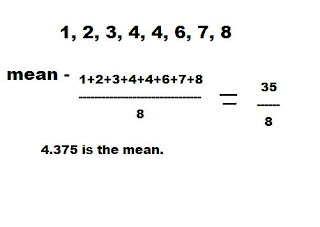 With an outlier the mean is a less "average". 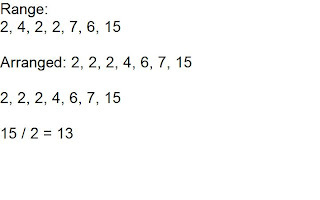 Arrange the datas in ascending order. find the data that is in the middle. 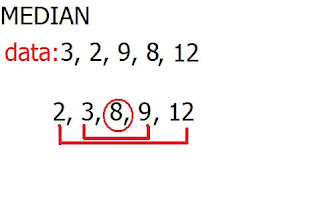 If there are 2 middle numbers, you ave to find the mean of the two datas. 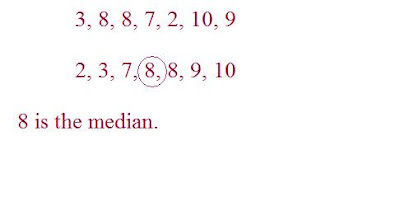 The median is great to use if there is an outlier. Look for the data that shows up the most common. You can have more than one mode. You can have no mode. Subtract the smallest data from the largest data. 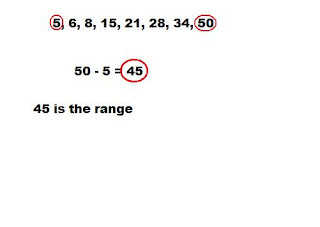 Here is a video about Mean, Median, Mode, and Range. 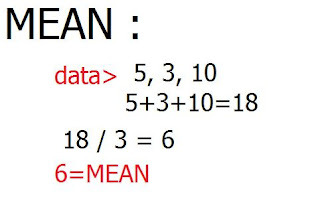 with an outlier the mean is less accurrate "average"
The middle number in a data set once arranged in ascending order. There can be 2 middle medians, you have to find the mean of them. More accurate then mean if the data has a outlier. 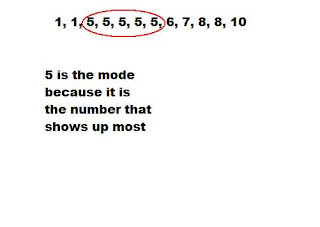 Uses all numbers to find the the middle. Arranged in order, ascending order. 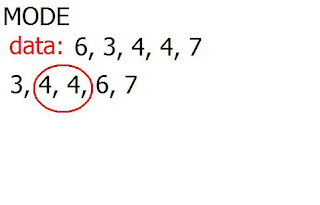 The most common number in a set of data. 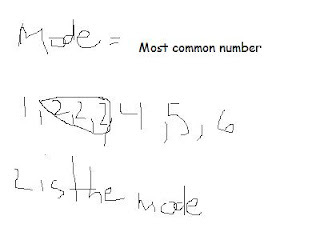 There can be more then 1 mode. There can be no mode. Subtract highest number to lowest number. - Arrange in ascending order. 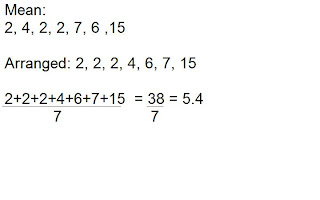 - Add all the numbers. - Then the number you got divide by. how many numbers are in the data. - With an outlier the mean is less accurate "average". 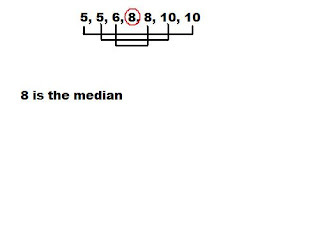 Median - Arrange in ascending order/numerical order. - Middle number in data. - Great to use if there is an outlier. 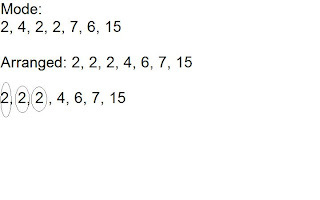 - Arrange the data in ascending order. 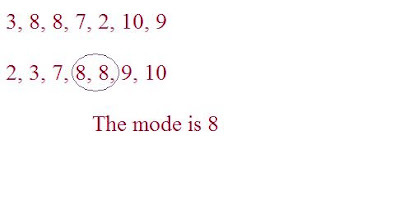 - There can be more then 1 mode. - The data that appears the most. - You can have no mode. 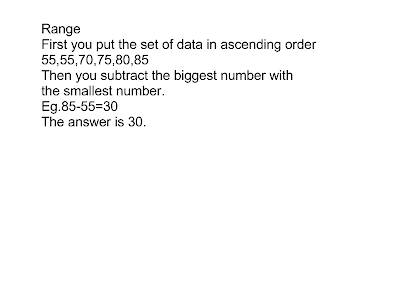 - Subtract the smallest data from the largest number. - Large range = outliers. 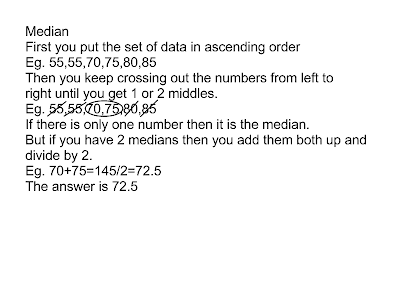 Here is a video of mean median and mode..